During World War II, the relations between art and war can be articulated around two main issues. First, art (and, more generally, culture) found itself at the centre of an ideological war. Second, during World War II, many artists found themselves in the most difficult conditions (in an occupied country, in internment camps, in death camps) and their works are a testimony to a powerful "urge to create." Such creative impulse can be interpreted as the expression of self-preservation, a survival instinct in critical times. War is a common theme in art and has inspired many great works. Throughout history, most representations of war depict military achievements and often show significant battle scenes. However, in the 19th century a “turn” in the visual representation of war became noticeable. Artists started to show the disastrous aspects of war, instead of its glorified events and protagonists. Such a perspective is best exemplified by Francisco Goya’s series, The Disasters of War (1810-1820, first published in 1863), and Otto Dix’s portfolio, Der Krieg (published in 1924). Francisco José de Goya y Lucientes was a Spanish romantic painter and printmaker. He is considered the most important Spanish artist of the late 18th and early 19th centuries and throughout his long career was a commentator and chronicler of his era. Immensely successful in his lifetime, Goya is often referred to as both the last of the Old Masters and the first of the moderns. He was also one of the great contemporary portraitists. The Disasters of War is a series of 82 prints created between 1810 and 1820 by the Spanish painter and printmaker Francisco Goya (1746–1828). Although Goya did not make known his intention when creating the plates, art historians view them as a visual protest against the violence of the 1808 Dos de Mayo Uprising, the subsequent Peninsular War of 1808–14 and the setbacks to the liberal cause following the restoration of the Bourbon monarchy in 1814. During the conflicts between Napoleon's French Empire and Spain, Goya retained his position as first court painter to the Spanish crown and continued to produce portraits of the Spanish and French rulers. Although deeply affected by the war, he kept private his thoughts on the art he produced in response to the conflict and its aftermath. He was in poor health and almost deaf when, at 62, he began work on the prints. They were not published until 1863, 35 years after his death. It is likely that only then was it considered politically safe to distribute a sequence of artworks criticising both the French and restored Bourbons. In total over a thousand sets have been printed, though later ones are of lower quality, and most print room collections have at least some of the set. During World War II, both traditions are present. 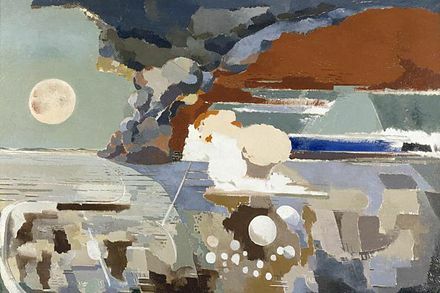 For instance, Paul Nash’s Battle of Britain (1941) represents a scene of aerial combat between British and German fighters over the English Channel. On the other hand, André Fougeron’s Street of Paris (1943) focuses on the impact of war and occupation on civilians. Paul Nash was a British surrealist painter and war artist, as well as a photographer, writer and designer of applied art. Nash was among the most important landscape artists of the first half of the twentieth century. He played a key role in the development of Modernism in English art. The year 1941 in art involved some significant events and new works. In totalitarian regimes (especially in Hitler’s Germany), the control of art and other cultural expressions was an integral part of the establishment of power. It reflects totalitarianism’s aim to control every single aspect of society and the individuals’ lives. However, art and culture had a special importance because they have the power to influence people, and they embody the identity of a nation, a community, a group of people. In Nazi Germany, Hitler's cultural politic was twofold. The first step was a “cultural cleansing”. German culture and society were said to be in decline because forces of decadence had taken over and corrupted it (it is the idea of the “enemy within”). [ citation needed ] The cultural cleansing was to be accompanied by a “rebirth” of German culture and society (Hitler had grand plans for several museums), which involved an exaltation of the “true spirit” of the German people in art. [ citation needed ] This officially sanctioned art was conservative and figurative, heavily inspired by Greco-Roman art. It was often grandiose and sentimental. In terms of contents, this art should represent and convey the regime's ideals. The Führermuseum, also referred to as the Linz art gallery, was an unrealized art museum within a cultural complex planned by Adolf Hitler for his hometown, the Austrian city of Linz, near his birthplace of Braunau. Its purpose was to display a selection of the art bought, confiscated or stolen by the Nazis from throughout Europe during World War II. The cultural district was to be part of an overall plan to recreate Linz, turning it into a cultural capital of Nazi Germany and one of the greatest art centers of Europe, overshadowing Vienna, for which Hitler had a personal distaste. He wanted to make the city more beautiful than Budapest, so it would be the most beautiful on the Danube River, as well as an industrial powerhouse and a hub of trade; the museum was planned to be one of the greatest in Europe. The Degenerate Art Exhibition was an art exhibition organized by Adolf Ziegler and the Nazi Party in Munich from 19 July to 30 November 1937. The exhibition presented 650 works of art, confiscated from German museums, and was staged in counterpoint to the concurrent Great German Art Exhibition. The day before the exhibition started, Hitler delivered a speech declaring "merciless war" on cultural disintegration, attacking "chatterboxes, dilettantes and art swindlers". Degenerate art was defined as works that "insult German feeling, or destroy or confuse natural form or simply reveal an absence of adequate manual and artistic skill". One million people attended the exhibition in its first six weeks. A U.S. critic commented "there are probably plenty of people—art lovers—in Boston, who will side with Hitler in this particular purge". It was clear in Stalin’s Soviet Union, where diversity in the arts was proscribed and “Socialist Realism” was instituted as the official style. Modern art was banned as being decadent, bourgeois and elitist. 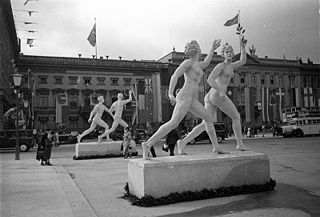 [ citation needed ] The comparison of sculptures placed by national pavilions during the 1937 International Exhibition in Paris is revealing. The exhibition was dominated by the confrontation between Germany and the Soviet Union, with their imposing pavilions facing each other. On one side, Josef Thorak’s sculptures were displayed by the German pavilion’s entrance. And on the other, Vera Mukhina’s sculpture, Worker and Kolkhoz Woman , was placed on top of the Soviet pavilion. The Degenerate Art Exhibition (Munich, 19 July-30 Nov. 1937) was made out of works confiscated in German museums. The works were placed in unflattering ways, with derogatory comments and slogans painted around them (“Nature as seen by sick minds”, “Deliberate sabotage of national defense”...). The aim was to convince visitors that modern art was an attack on the German people. Mostly, these works of art were Expressionist, abstract or made by Jewish and Leftist artists. The exhibition was displayed in several German and Austrian cities. Subsequently, most of the artworks were either destroyed or sold. 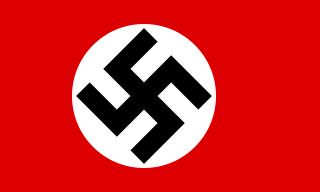 France was occupied by Nazi Germany from 22 June 1940 until early May 1945. An occupying power endeavours to normalise life as far as is possible since this optimises the maintenance of order and minimises the costs of occupation. The Germans decreed that life, including artistic life should resume as before (the war). There were exceptions. Jews were targeted, and their art collections confiscated. Some of this consisted of modern, degenerate art which was partly destroyed, although some was sold on the international art market. Masterpieces of European art were taken from these collectors and French museums and were sent to Germany. Known political opponents were also excluded and overtly political art was forbidden. During the rise of Nazism, some artists had expressed their opposition. Following the establishment of the Third Reich, modern artists and those of Jewish ancestry were classed as degenerate. Any Jewish artists, or artists who were known opponents to the regime, were liable to imprisonment unless they conformed with the authorities’ view of what was "acceptable" in art. These artists were all in danger. Among those who chose to stay in Germany, some retreated into an “inner exile”, or “inner emigration"  (“Innere Emigration”). Many artists chose to leave Germany. But their exile did not secure their position in the art world abroad. Their personal and artistic security depended on the laws and attitude of the country of exile. Some sought collaboration with others in exile, forming groups to exhibit, such as the Free German League of Culture founded in 1938 in London. One of their goals was to show that German culture and art were not to be equated with the cultural expressions sanctioned and produced by the Nazi regime. In the US, citizens of Japanese extraction also faced internment in very poor living conditions and with little sympathy for their plight throughout the period of hostilities and beyond. Modern art became the bearer of liberal values, as opposed to the reactionary artistic preferences of the totalitarian regimes. Artistic choices embodied different positions in the ongoing ideological battle. Placing Alberto Sánchez Pérez's abstract sculpture,  The Spanish people have a path that leads to a star (1937), at the entrance of the pavilion of the Spanish Republic was a political statement. So was commissioning modern artists to create works of art for this pavilion. Pablo Picasso showed two works: a pair of etchings entitled The Dream and Lie of Franco , 1937, and his monumental painting, Guernica, 1937. Joan Miró painted a huge mural entitled Catalan Peasant in Revolt (aka The Reaper, destroyed), and he did a poster entitled “Aidez l’Espagne” (Help Spain), meant to support the Republicans’ cause. The American artist Alexander Calder created the abstract sculpture Mercury Fountain (1937). The involvement of a non-Spanish artist was also an important statement in an era dominated by the rise of nationalism, both in democratic and totalitarian regimes. Even in democracies, voices called for a return to a more representational style. For instance, some criticized the central place given to Picasso's Guernica because it was not explicit enough in its denunciation and was too complex. They would have preferred that the focus be placed on paintings such as Horacio Ferrer’s Madrid 1937 (Black Planes), from 1937. Its “message” was much clearer and – as a consequence – it functioned better as a political statement. When they wanted to support the democratic cause and protest against Fascism and dictators, artists were often encouraged to put aside their modernist style and express themselves in a more realist (i.e. representational) style. For instance, Josep Renau, the Republican Government's director general of Fine Arts, said in 1937: “The poster maker, as an artist, knows a disciplined freedom, a freedom conditioned by objective demands, external to his individual will. Thus for the poster artist the simple question of expressing his own sensibility and emotion is neither legitimate nor practically realizable, if not in the service of an objective goal. ” And the French author, Louis Aragon, declared in 1936: “For artists as for every person who feels like a spokesperson for a new humanity, the Spanish flames and blood put Realism on the agenda. ” In other words, the artist's political engagement required a submission of the work's artistic aspects to the expression of the political content. Degenerate art was a term adopted in the 1920s by the Nazi Party in Germany to describe modern art. During the dictatorship of Adolf Hitler, German modernist art, including many works of internationally renowned artists, was removed from state owned museums and banned in Nazi Germany on the grounds that such art was an "insult to German feeling", un-German, Jewish, or Communist in nature. Those identified as degenerate artists were subjected to sanctions that included being dismissed from teaching positions, being forbidden to exhibit or to sell their art, and in some cases being forbidden to produce art. Karl August Leopold Böhm was an Austrian conductor. He was best known for his performances of the music of Mozart, Wagner and Richard Strauss. Degenerate music was a label applied in the 1930s by the Nazi government in Germany to certain forms of music that it considered to be harmful or decadent. The Nazi government's concern for degenerate music was a part of its larger and more well-known campaign against degenerate art. In both cases, the government attempted to isolate, discredit, discourage, or ban the works. Felix Nussbaum was a German-Jewish surrealist painter. Nussbaum’s artwork gives a rare glimpse into the essence of one individual among the victims of the Holocaust. Adolf Ziegler was a German painter and politician. He was tasked by the Nazi Party to oversee the purging of what the Nazi Party described as "degenerate art", by most of the German modern artists. He was Hitler's favourite painter. The art of the Third Reich was the government-approved art produced in Nazi Germany between 1933 and 1945. Upon becoming dictator in 1933, Adolf Hitler gave his personal artistic preference the force of law to a degree rarely known before. Nazi plunder refers to art theft and other items stolen as a result of the organized looting of European countries during the time of the Third Reich by agents acting on behalf of the ruling Nazi Party of Germany. Plundering occurred from 1933 until the end of World War II, particularly by military units known as the Kunstschutz, although most plunder was acquired during the war. In addition to gold, silver and currency, cultural items of great significance were stolen, including paintings, ceramics, books, and religious treasures. Although most of these items were recovered by agents of the Monuments, Fine Arts, and Archives program, on behalf of the Allies immediately following the war, many are still missing. There is an international effort underway to identify Nazi plunder that still remains unaccounted for, with the aim of ultimately returning the items to the rightful owners, their families or their respective countries. Gert Heinrich Wollheim was a German painter associated with the New Objectivity, and later an expressionist who worked in United States after 1947. Otto Pankok was a German painter, printmaker, and sculptor. Jankel Adler was a Jewish-Polish painter and printmaker. Censorship in Nazi Germany was extreme and strictly enforced by the governing Nazi Party, but specifically by Joseph Goebbels and his Reich Ministry of Public Enlightenment and Propaganda. Censorship within Nazi Germany included control of all forms of mass communication, which included newspaper, music, literature, radio, and film. The same body also produced and disseminated their own literature which were solely devoted to furthering Nazi ideas and myths. Anti-semitism lay at the core of their works, and included films such as Jud Süß and The Eternal Jew. The ministry promoted the cult of Adolf Hitler by sponsoring early films such as Triumph of the Will of the 1934 rally and The Victory of Faith made in 1933, and which survives now as a single copy recently discovered in the UK. It was banned by the Nazis owing to the prominent role of Ernst Roehm, who was murdered by Hitler on the Night of the Long Knives in 1934. Richard Klein (1890–1967) was a German artist, known for his work as a medallist from the start of World War I in 1914, and mainly for his work as a favoured artist of the Nazi regime. Klein was director of the Munich School of Applied Arts and was one of Adolf Hitler's favourite painters. Dorothy Bohm is a photographer based in London, known for her portraiture, street photography, early adoption of colour, and photography of London and Paris; she is considered one of the doyennes of British photography. Kunstschutz is the German term for the principle of preserving cultural heritage and artworks during armed conflict, especially during the First World War and Second World War, with the stated aim of protecting the enemy's art and returning after the end of hostilities. It is associated with the image of the "art officer" (Kunstoffizier) or "art expert" (Kunstsachverständiger). Heinz Kiwitz was a German artist. His woodcuts were in the German Expressionist style. An anti-fascist, he was arrested following the Nazis' seizure of power. He survived imprisonment in Kemna and Börgermoor concentration camps and was released in 1934. He went into exile in 1937, first living in Denmark, then in France, where he again began to fight Nazism. In 1938, he went to Spain to fight in the Spanish Civil War, where he apparently perished. Emy Roeder was a modern German sculptor born in Würzburg, Germany. During the first third of the twentieth century she was one of a number of women that were associated with the German Expressionist movement of Modern art. She was the first woman to achieve Master Student of sculpture as a student at the Berlin Academy In 1937 her work was labeled Degenerate art by the Nazis. After World War II she was arrested in Italy by the Allies because she was a German citizen and then sent to an internment camp. She received the Villa Romana prize in 1936, and was awarded the Federal Cross of Merit for her life work in 1960. She died, aged 81, in Mainz. Large Head was a sculpture made by German artist Otto Freundlich in 1912 and thought to have been destroyed in around 1941. It is now considered to be one of the most important modernist sculptures made in Germany before the First World War. Hildebrand Gurlitt was a German art dealer, art historian and war profiteer, who traded in "degenerate art" during the Nazi era, and purchased paintings in Nazi-occupied France, many of them stolen from their original owners, for Hitler's planned Führermuseum and for himself; he also inherited family artworks from both his father and his sister, an accomplished artist in her own right. His collection of over 1,500 items, including works by Marc Chagall, Albrecht Dürer, Henri Matisse, Pablo Picasso, Franz Marc and Toulouse-Lautrec among many others, was brought to public attention in 2012 in the possession of his son, Cornelius Gurlitt, who bequeathed it upon his death in 2014 to the Museum of Fine Arts Bern in Switzerland. Albert Reuss was a painter and sculptor born in Vienna who fled to England in 1938 following the Anschluss, Adolf Hitler’s annexation of Austria to the German Reich. In the process, Reuss lost many members of his family, and the reputation he had built up as an artist in Vienna. He continued to work as an exiled artist in England, but his style changed dramatically, reflecting the trauma he had suffered. Several provincial galleries in England hold his work, most notably Newlyn Art Gallery in Cornwall, the British Museum and the Victoria and Albert Museum in London, the Österreichische Galerie Belvedere and the Albertina both in Vienna, and the Tel Aviv Museum of Art in Israel.